On the Saturday of BETT Jonathan Furness' students from Kings Road Primary (they don't have an apostrophe) in Chelmsford, with their fab headteacher Phil Kyriacou (he is so ambitious for how good they might be, and so confident in them), came along to the quietest day of what had been a manic BETT. Jonathan is an inspired and inspiring teacher and you can see the difference he has made too; as the show started the students just quietly got on with some wonderful learning embracing all kinds of technologies - here, as the show opens, they are just camped out all over our stand and the Show with their projects. 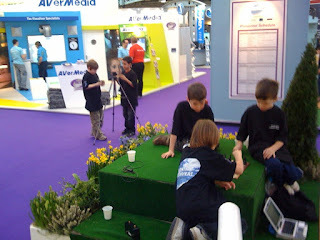 Later, having been introduced to John Davitt's clever lesson planning tool "Learning Score" they produced a lesson plan for teaching chess, and introduced it in a spontaneous presentation on the stand. I think the 21st century will be Ok with this lot!